Coarse-grain (CG) techniques applied to molecular simulations allow for a considerable extension of the accessible size and time scales keeping the physical/chemical sense of the fundamental interactions ruling the structure and dynamics of biomolecular systems. The philosophies used to coarse atomistic details can be classified into bottom-up and top-down approaches. In the first case, interaction parameters for a given molecular representation are developed by fitting to higher level (usually atomistic) simulations. In the top-down approach, parameters are chosen to fit structural or energetic experimental data. 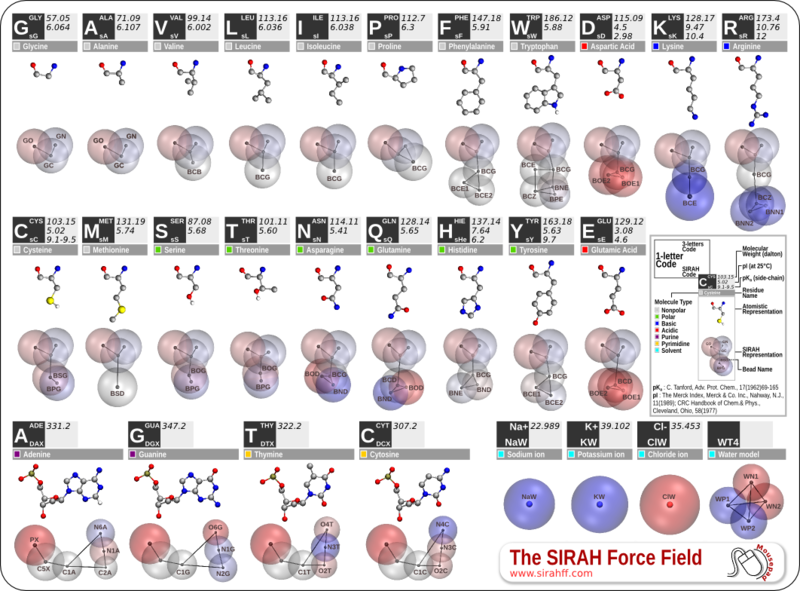 SIRAH is a top-down generic force field derived to fit structural properties. The force field contains parameters for explicit water, electrolytes, DNA and proteins. Molecular interactions are evaluated using a classical Hamiltonian, which facilitates its implementation in common molecular dynamics packages. This initiative is carried out in the group of Biomolecular Simulations, the Institut Pasteur de Montevideo, Uruguay.